Last night the blue moon waxed nostalgic for me. I have seen the flags at half staff all week and have thought a lot about a night long ago at my Grandma’s house. 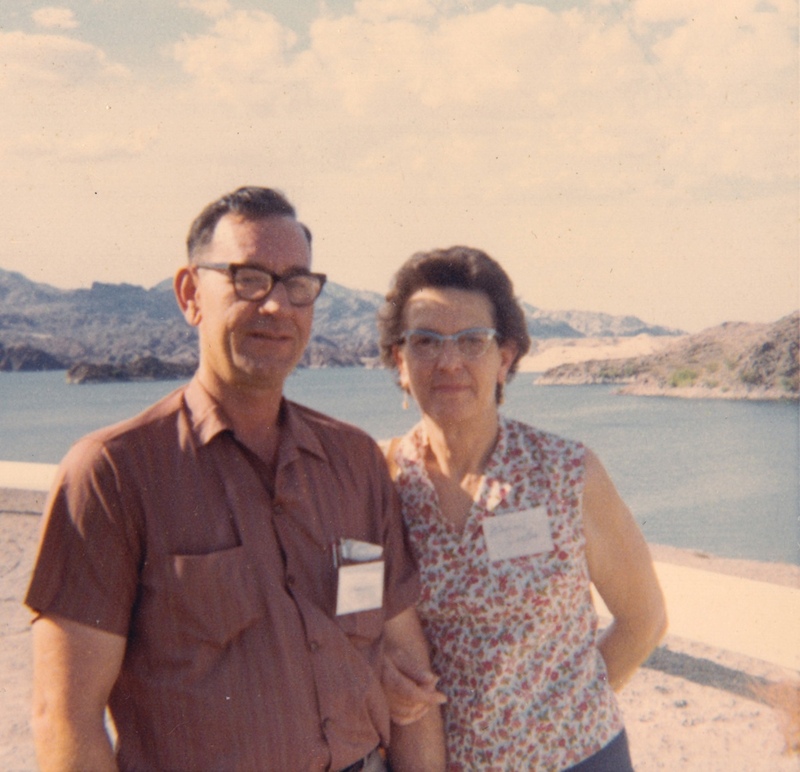 On July 20th 1969 my Pop and Grandpa were away doing assay work on their mining claim up in northern Nevada. Grandma, who lived a couple of doors down the street came into our house about dinner time and asked my mom why the TV wasn’t on. When Pop was away my Mom loved to turn off the TV, turn on the stereo and get lost in a book. She was enjoying the peace and quiet, reading on the couch. Grandma offered to take us all off her hands for the night and walked us down the street and sat us on the floor in front of the TV. No admonitions about sitting too close to the TV on this night. She sat my brothers and I down a couple of feet from the screen. 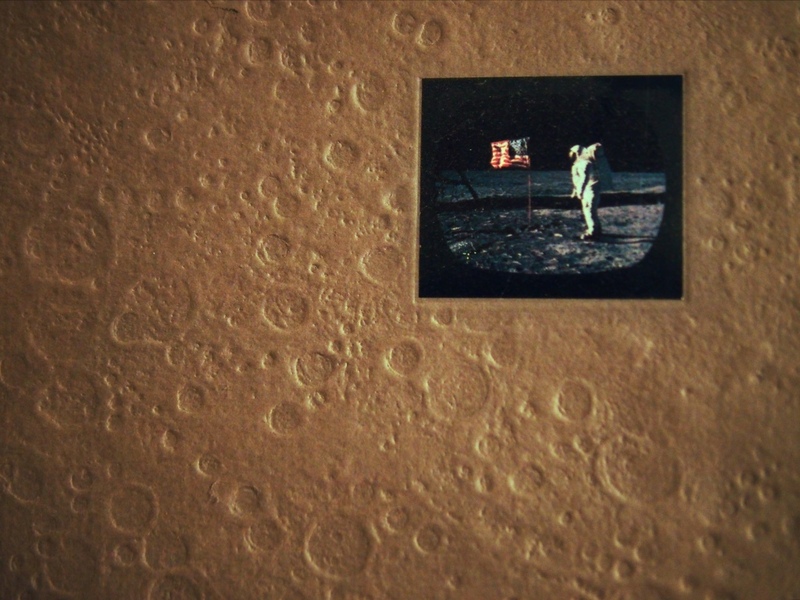 This is a book about the moon landing put out by CBS – I love the crater filled cover. She sat on the floor with us as we watched in wonder as two men stepped onto the surface of the moon. My brothers seemed to be fading, falling asleep. She whispered into my ear that this was something I would remember for the rest of my life. I told her that I wanted to be an astronaut, but they were all boys. She told me that I could be anything I wanted to be. Before I fell asleep that night she carried me out to the back yard where we looked up at the moon together and told Neil and Buzz goodnight. Safe journey Neil, Grandma was right, I will never forget that night. This entry was posted in Photography, Reminiscences, Uncategorized and tagged 1969, blue moon, memories, moon landing, Neil Armstrong, Olympus E-M5, OMD, photography by artsifrtsy. Bookmark the permalink. Great, great set. I agree with Tom – enter it. Thanks – I appreciate your comment. 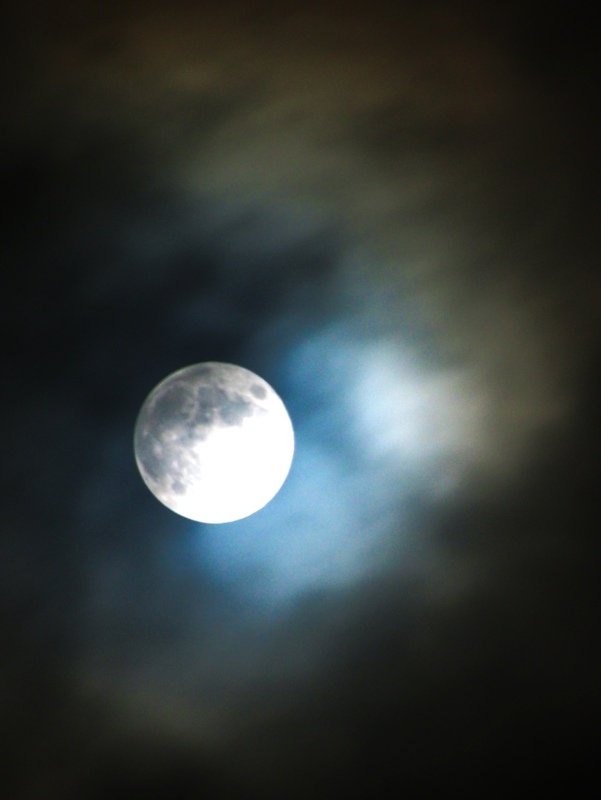 It was an awesome moon that night. You ought to submit your fabulous photo of the blue moon to the Digital Photography Review’s “moonrise challenge”: http://www.dpreview.com/challenges/Challenge.aspx?ID=7283 It is a beautiful shot. I really enjoyed this post! Thank you for sharing it. Great moon shot. I feared no one nearby would get one due to the cloud cover. Enjoyed your story as well. Great photos and wonderful story! Thanks Kyle – I appreciate you stopping by! Beautiful story and photo to go along with it. What great memories. I love this so much – we were vacationing with family friends on a houseboat of all things on Kentucky Lake. All the kids had been tucked into the bunks and the grownups were listening to the play by play on the radio. 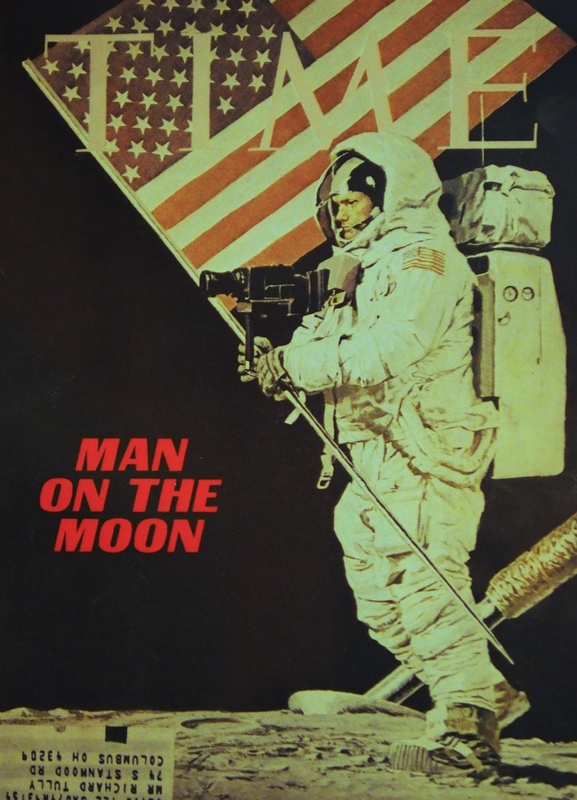 I was 14, and remember looking up and the sky and listening to the news man saying that a man was on the moon. Made the nights looking at the moon seem different the rest of that week. And what a precious memory to have of your grandmother – a treasure! 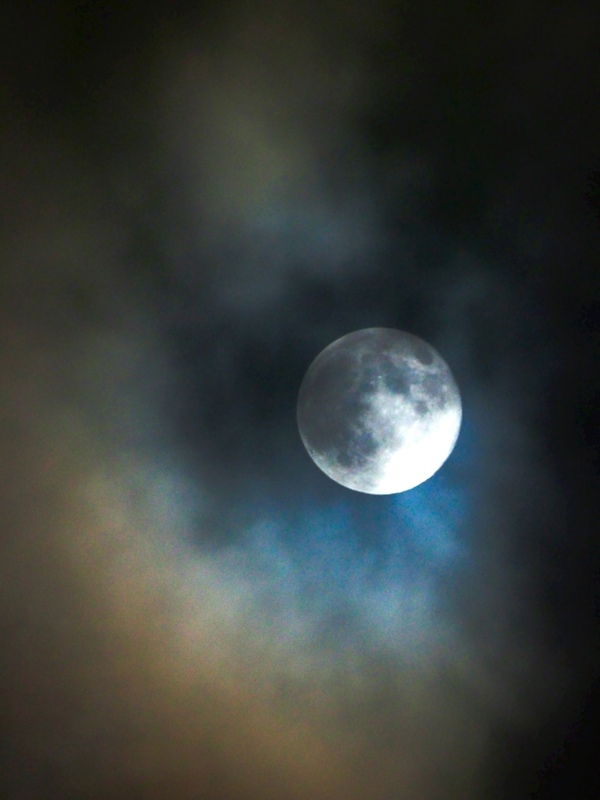 Thanks, Hearing it on the radio under the moon – must have been amazing. My grandma was a treasure. She made things like this almost magical. I heard it on the radio too. It was after a horse show. My sisters and I were lying on the roof of a horse trailer. Everybody had turned their car radios to the same station listening to the moonwalk coverage. I remember the sense of awe hearing the radio voices in the dark and starring up at the moon. Your moon shots are just gorgeous! Thanks for sharing your story too. Thanks! It’s neat how this singular moment brought us all to the same place at the same time. How cool to listen and watch the moon. I can picture that moment also. I was at school and the teachers had crowded as many children as possible (sitting cross-legged on the floor) into the school rooms which had a tv. We sat there for some time waiting and watching (for that first walk on the moon). I don’t know how long we sat there, but I DO remember the actual ‘walk’. Just like I remember watching black & white tv, a fax machine, the enormous computers that were housed in a work place, the enormous first mobile phones and a whole lot more ‘firsts’. How times have changed. I hadn’t thought about school children in countries around the world – how cool. I was 7 and remember it vividly. My Grandma knew it was a momentous thing. Times really have changed. I think about how much my grandparents saw, and now I work with people who were not even born yet when we landed on the moon. I tried taking a picture of the moon last night. All I have is a cheapy camera and I’m afraid it looks more like a lightening bug. 🙂 Yours are breathtaking. Thanks! Thanks – I got lucky for about 3 minutes. It was so bright that I couldn’t focus until some light clouds were over it. It really turned out great.